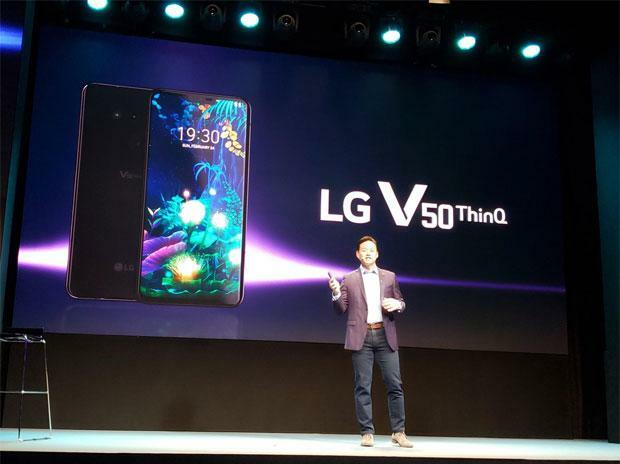 South Korea's LG Electronics unveiled a 5G smartphone on Sunday with a dual screen, the latest handset maker to pitch a new design feature in an effort to revive flagging sales. The two screens on the new V50ThinQ work independently, so a user can watch a film on one screen while browsing the Internet on the other. LG, the world's No.7 smartphone maker, saw its sales decline by a quarter last year as Chinese rivals Huawei Technologies and Xiaomi grabbed market share in a slightly weaker global market. Both announced 5G phones in Barcelona on the eve of the Mobile World Congress, the telecoms industry's main annual get together, with Xiaomi pitching a $680 model and Huawei smashing the price ceiling with $2,600 folding phone. LG nevertheless retains a following among those who value good video and audio quality. Addressing those users, LG launched a second phone, the G8ThinQ, which can be unlocked without touching the screen. The handset instead uses light sensors to scan the veins in a user's hand or to recognise their face. The phone's front-facing camera, which uses a sensor chip developed by Germany's Infineon Technologies , can scan in three dimensions - making it more secure than existing biometric methods of unlocking phones such as fingerprints. LG product evangelist David Montanya told a launch event it would be harder to 'spoof' than the FaceID feature used in Apple's iPhone X because the vein structure in a user's hand has less than one chance in a billion of being the same as anyone else's. Users can also activate features with gestures - for example to play or pause a song or video, or adjust the volume, by twisting their fingers, emulating the character played by Tom Cruise in science-fiction detective thriller Minority Report. LG did not set release dates or announce prices for the new phones, but said the 5G model should hit stores in the first half of the year.